Hilary Davan Wetton has a major career both as a choral and orchestral conductor. A pupil of Sir Adrian Boult, he has been Associate Conductor of the London Mozart Players since 2010 and is also Musical Director of one of Britain’s leading choirs: the City of London. He is Conductor Emeritus of the Guildford Choral Society and was Founder Conductor of the Holst Singers. He performs regularly at the Barbican Hall and St John’s Smith Square. With the City of London Choir he has recorded Finzi’s In Terra Pax,Beethoven’s Der Glorreiche Augenblick; with the Guildford Choir Holst’s Choral Symphony Vaughan Williams’ Five Tudor Portraits and Hodie; with the Holst Singers VW’s G Minor Mass and an outstanding disc of Holst’s The Evening Watch. Founder Conductor of the Milton Keynes City Orchestra from 1975-2007, he appeared in many national and international festivals and tours, commissioned major works and recorded repertoire by 19thcentury English composers Wesley, Crotch, Potter and Sterndale Bennett. His disc of Holst’s Planets Suite with the Royal Philharmonic Orchestra was the recommended version in the Penguin CD Guide. He was Principal Conductor of the Wren Orchestra from 1989-1997. Hilary has a particular rapport with young people and has worked regularly with the National Children’s Orchestra of Great Britain, and youth orchestras in Birmingham and Edinburgh. 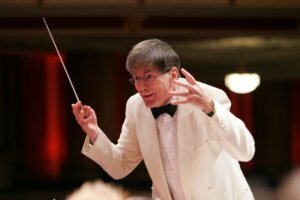 In 2011 he conducted combined youth orchestra in Mahler’s 1st Symphony in Croydon, a unique collaboration with the London Mozart Players. Recent work includes Elgar The Dream of Gerontius at the Royal Albert Hall, Bach St Matthew Passion, Elgar Music Makers and Lambert Rio Grande in Leicester, concerts in Oxford, concerts for LMP and Raymond Gubbay and a major commission – The Fire of Londonby Richard Brown – performed at Cadogan Hall with the RPO. Future plans include conducting Beethoven 9th Symphony with the RPO in the Royal Albert Hall and Bach St John Passion with the City of London Choir.